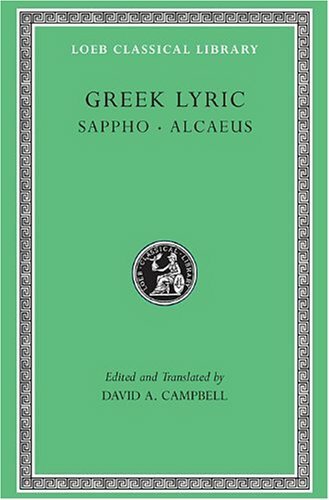 This volume contains the poetic fragments of the two illustrious singers of early sixth-century Lesbos: Sappho, the most famous woman poet of antiquity, whose main theme was love; and Alcaeus, poet of wine, war, and politics, and composer of short hymns to the gods. Also included are the principal testimonia, the ancients' reports on the lives and work of the two poets. The five volumes in the Loeb Classical Library edition of Greek Lyric contain the surviving fragments of solo and choral song. This poetry was not preserved in medieval manuscripts, and few complete poems remain. Later writers quoted from the poets, but only so much as suited their needs; these quotations are supplemented by papyrus texts found in Egypt, most of them badly damaged. The high quality of what remains makes us realise the enormity of our loss. Volume I presents Sappho and Alcaeus. Volume II contains the work of Anacreon, composer of solo song; the Anacreontea; and the earliest writers of choral poetry, notably the seventh-century Spartans Alcman and Terpander. Stesichorus, Ibycus, Simonides, and other sixth-century poets are in Volume III. Bacchylides and other fifth-century poets are in Volume IV along with Corinna (although some argue that she belongs to the third century). Volume V contains the new school of poets active from the mid-fifth to the mid-fourth century and also collects folk songs, drinking songs, hymns, and other anonymous pieces.